Our fourteenth top 10 trophy in a row was received in 2018 for coming in 2nd place out of 359 teams. Our thirteenth top 10 trophy in a row was received in 2017 for coming in 2nd place out of 358 teams. Our twelfth top 10 trophy in a row was received in 2016 for coming in 2nd place out of 358 teams. Our eleventh top 10 trophy in a row was received in 2015 for coming in 1st place out of 346 teams. Our tenth top 10 trophy in a row was received in 2014 for coming in 1st place out of 365 teams. 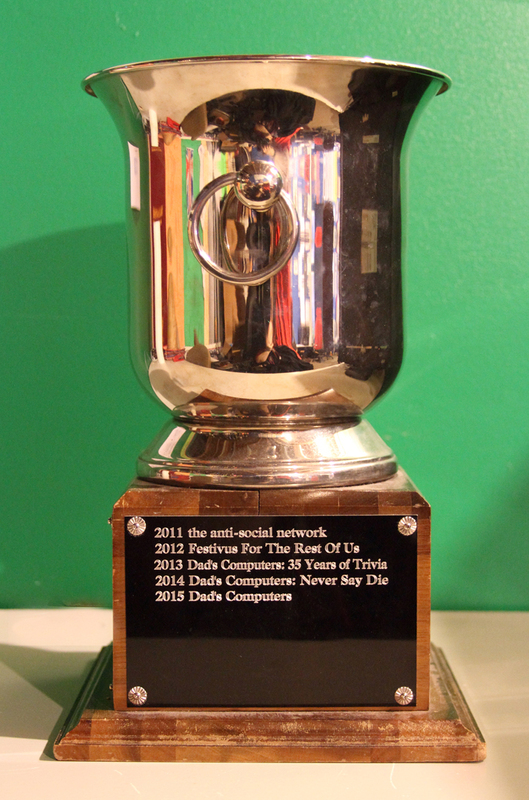 Our ninth top 10 trophy in a row was received in 2013 for coming in 1st place out of 373 teams. Our eighth top 10 trophy in a row was received in 2012 for coming in 2nd place out of 385 teams. 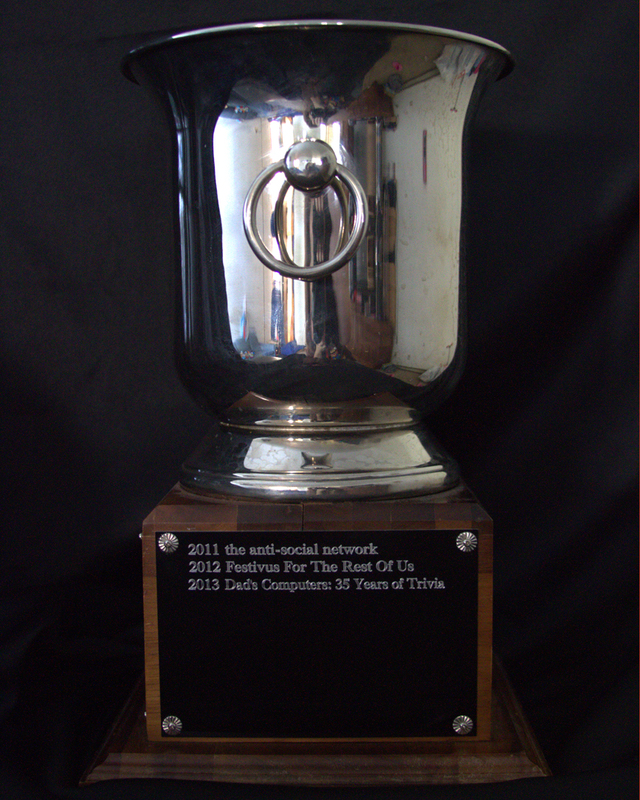 Our seventh top 10 trophy in a row was received in 2011 for coming in 2nd place out of 395 teams. Our sixth top 10 trophy in a row was received in 2010 for coming in 6th place out of 414 teams. Our fifth top 10 trophy in a row was received in 2009 for coming in 2nd place out of 415 teams. Our fourth top 10 trophy in a row was received in 2008 for coming in 5th place out of 433 teams. Our third top 10 trophy in a row was received in 2007 for coming in 6th place out of 436 teams. 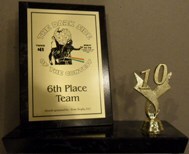 Our second top 10 trophy was received in 2006 for coming in 9th place out of 423 teams. 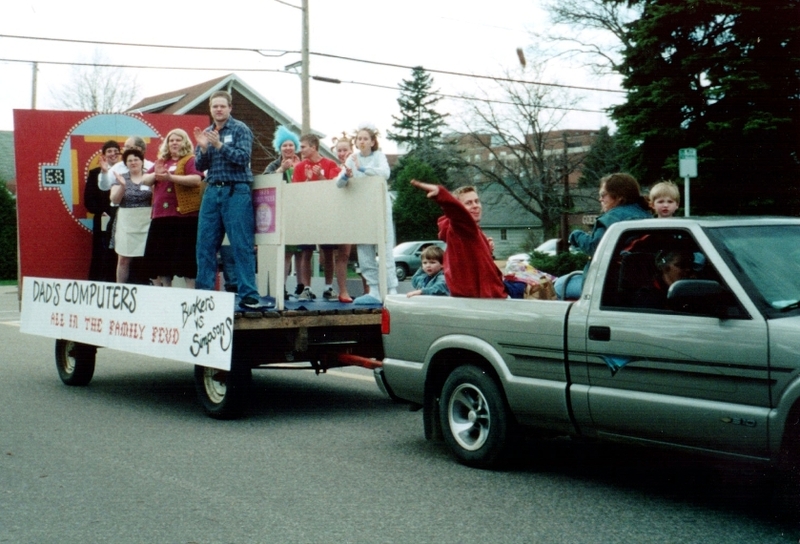 Our first top 10 trophy was received in 2005 for coming in 7th place out of 433 teams. Getting our first 500 point question that year helped quite a bit! 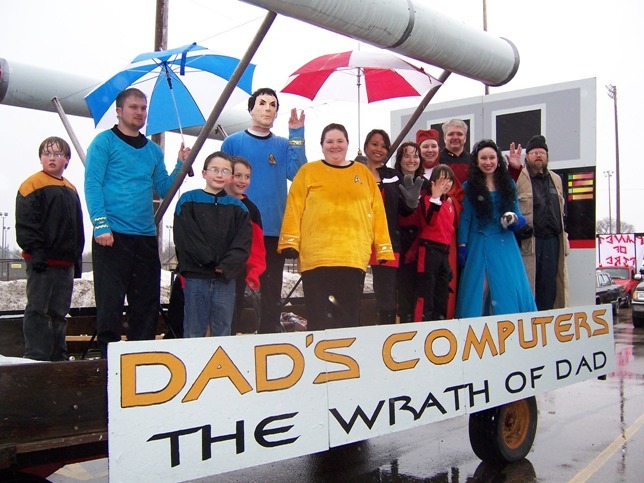 This year our theme was "Dad's Computers: The Wrath of Dad" Our float was turned into the Star Trek Enterprise, we all dressed up like Star Trek characters and played the theme to Star Trek for our music. The weather was terrible with wind, snow, hail, rain but we toughed it out. 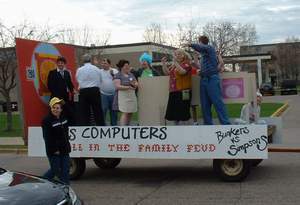 Since it was 2007 we decided to have our theme be "Dad's Computers: Trivia Royale" Our float had a huge backboard with slot machines and a huge spinning roulette wheel. We also decorated the float with big dice pillars and a poker table and had everyone on the float dressed as a character from a bond movie. We played two versions of the James Bond theme song. 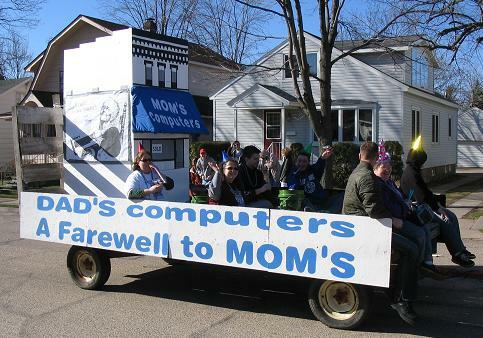 Since Oz sold Mom's computers, our namesake, our team theme was "Dad's Computers: A Farewell to Moms" Our float was a giant Mom's computers building made out of pieces of Styrofoam. We also played ""Nah, Nah, Hey, Hey, Kiss Him Goodbye"
Since the official theme was "All in the Contest" featuring Archie Bunker, our theme was "Dad's Computers: All in The Family Feud" and our feuding families were The Bunkers vs. The Simpsons. We had the theme to "Family Feud" play while we clapped along excitedly like they do in the intro. 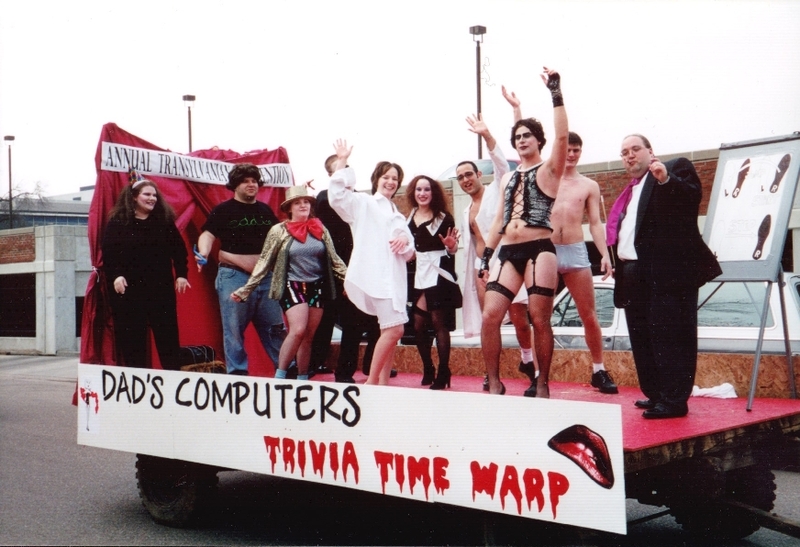 The Official theme this year was "Old Days" so we thought of Time Warping back to the old days and did our float as "Dad's Computers: Trivia Time Warp". 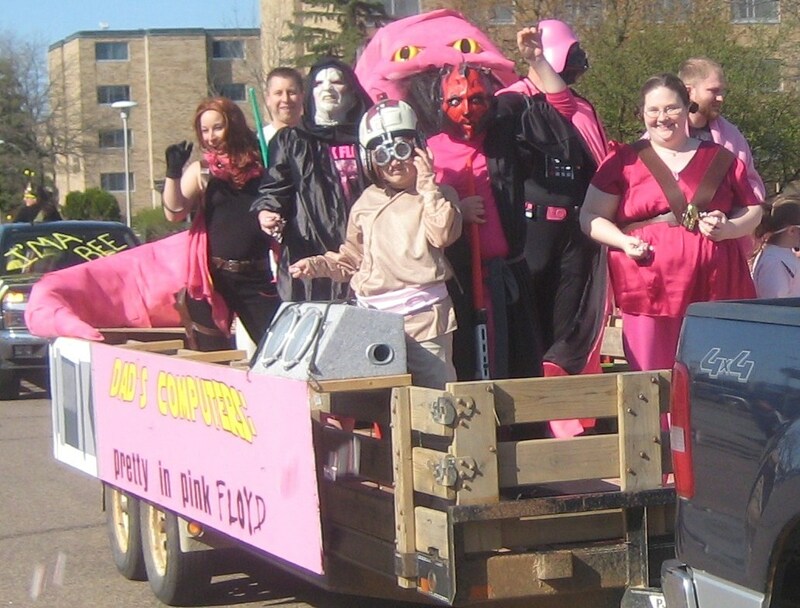 We dressed up like the cast from The Rocky Horror Pictures show and danced to time warp 11 times during the parade route. Let's Do Time Warp Again! The Official theme this year was "The Bug Strikes" so we thought of our computers being sick. 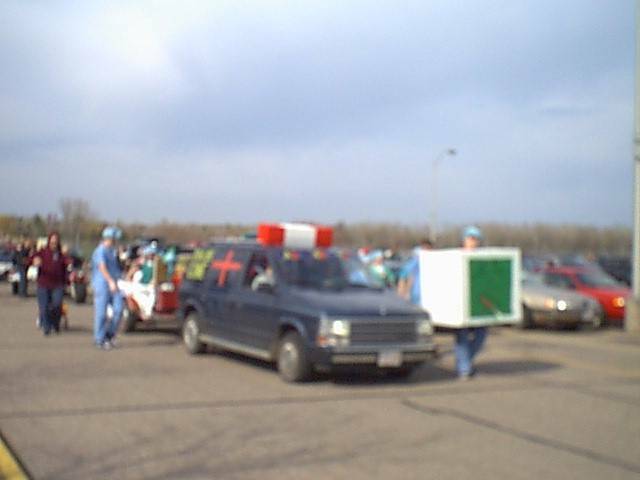 Our theme was "Dad's Computers: Bug B Gone" and most of dressed up like Doctors caring for our sick computers. Dad and the kids also dressed up like bugs. .